A few weeks ago, my sister Katy asked me if I had a chocolate mandelbrot recipe. I made her some cinnamon mandelbrot last time she was in town. She really enjoyed them, so I taught her how to make them. As we were going through the recipe, she asked if they could be made with chocolate. Katy loves chocolate… in fact, I think it’s safe to say she’s a choco-holic. I had some pretty good chocolate mandelbrot recipes, but none that were good and chocolaty enough for my sis. She deserves the very best! 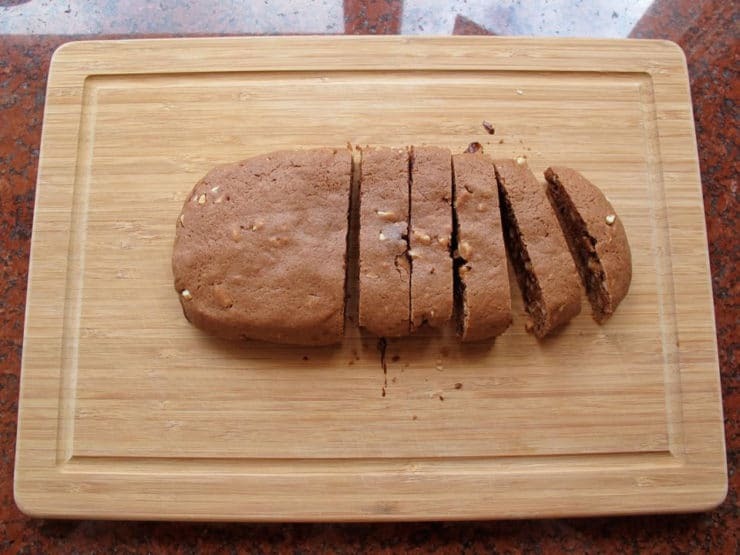 So, I created the recipe I’m sharing with you today… I call it my Triple Chocolate Almond Mandelbrot. Chocolate mandelbrot dough with chocolate chips, dipped in chocolate. Did I mention chocolate?? 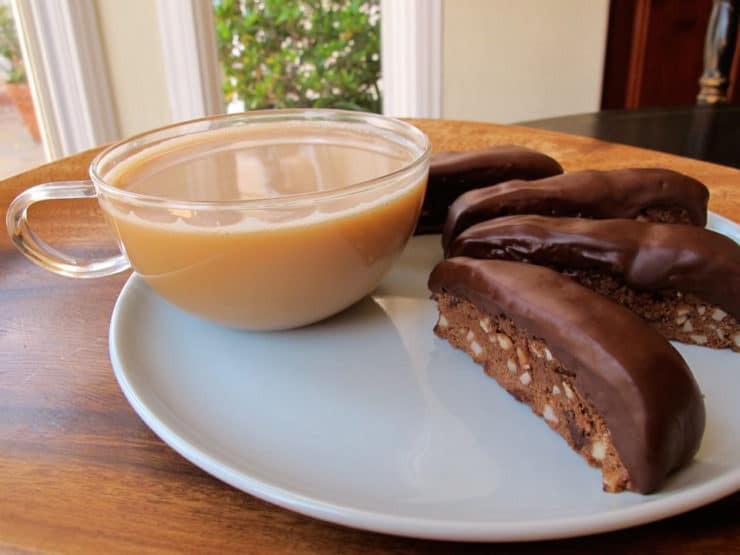 For those of you who don’t know about these delicious cookies, mandelbrot are an Ashkenazi Jewish dessert dating back to the early nineteenth century. 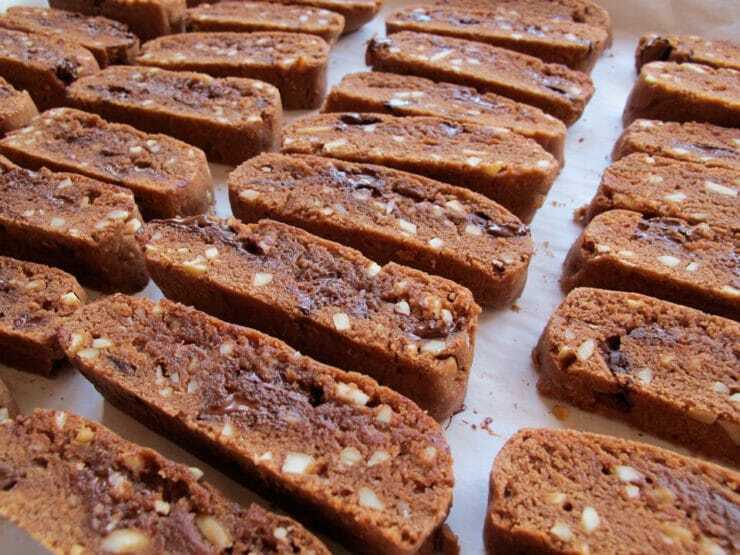 They are closely related to the Italian cookies known as biscotti, which were first made in the Middle Ages. The word mandelbrot means almond (mandel) and bread (brot) in both German and Yiddish. In America, these tasty little cookies are known as mandel bread. Typically mandelbrot are twice-baked, which makes them crispy and crunchy. They’re perfect for dipping in your tea or coffee. This recipe is pretty simple, but it will take some planning, because the dough needs to chill at least 2 hours in the fridge before you shape it. Since this recipe was an experiment of sorts, I just used what I had in the pantry. I had a couple of bags of large Ghiradelli chocolate chips, which were yummy but a little tough to work with (they take longer to cool and harden then regular-sized chips). Next time, I’ll probably use regular-sized chocolate chips or chunks. Also, I chopped up some slivered almonds because that’s what I had in the pantry. I think thinly sliced whole almonds would work better (and look prettier). 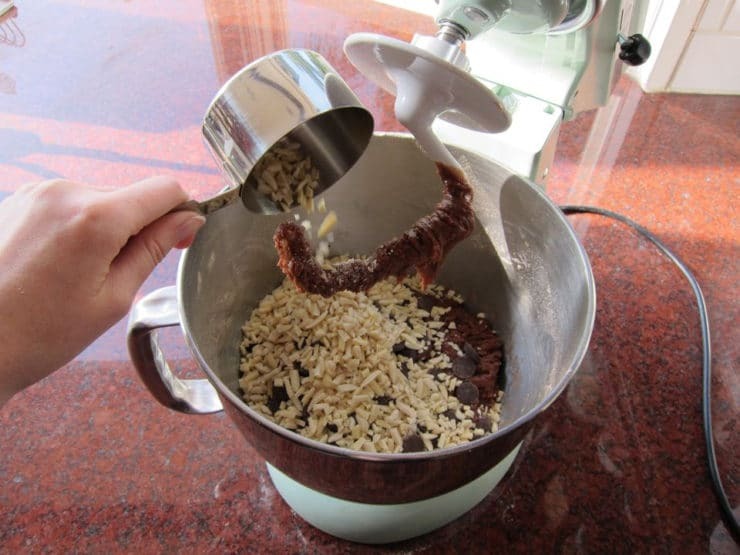 You could also just chop up some regular skin-on almonds… really, whatever you have on hand will work fine! 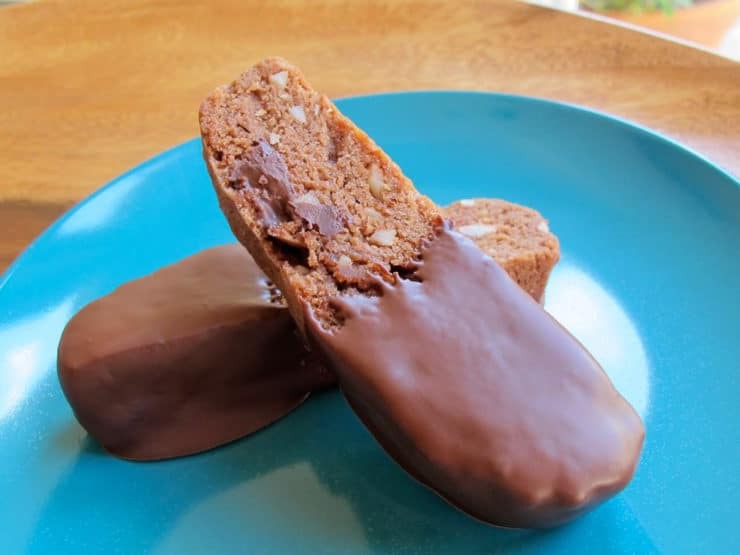 The almonds add a nice crunch and texture to the mandebrot, and the nuttiness balances out all of that rich, chocolaty goodness. 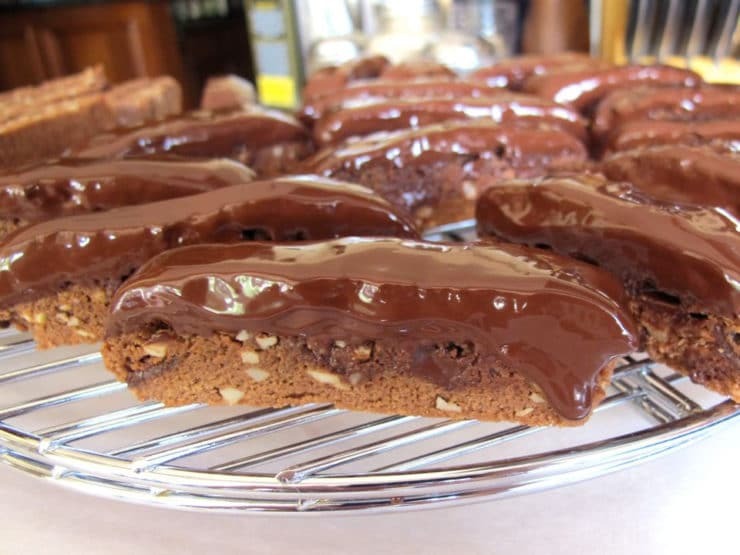 A decadent recipe for Triple Chocolate Almond Mandelbrot, also known as Mandelbread. Nutty, cocoa-rich chocolate chip dough dipped in chocolate. 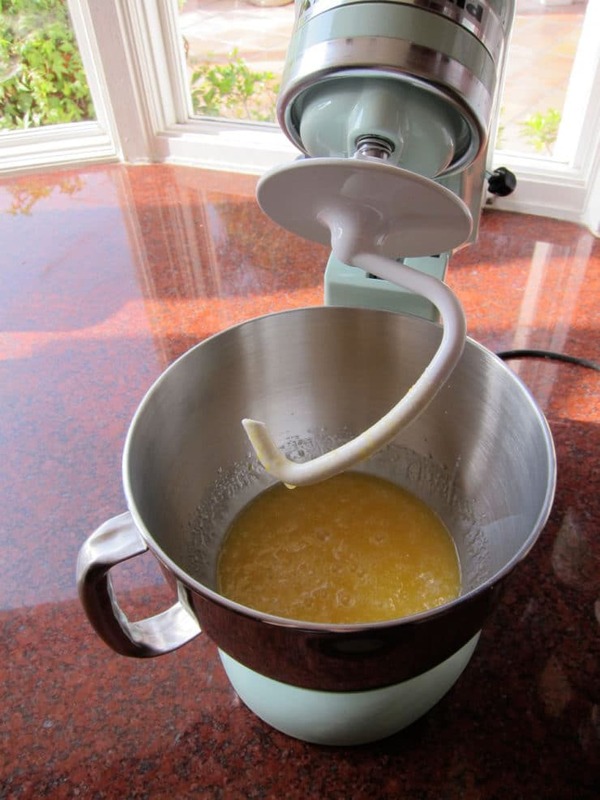 Using your electric mixer, mix together eggs, sugar, canola oil, vanilla and salt on medium high speed until well combined. 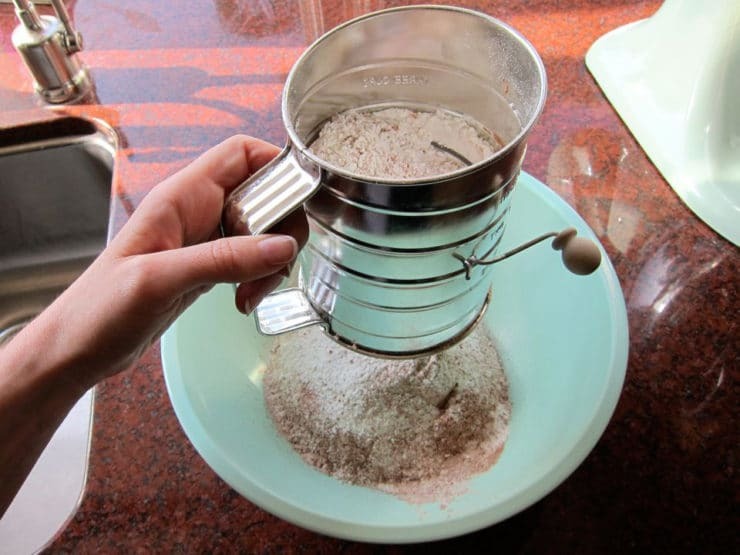 In a separate bowl, sift together flour, cocoa powder, and baking powder. Gradually add the dry ingredients to the wet, mixing on medium low after each addition, until a smooth, sticky dough forms. 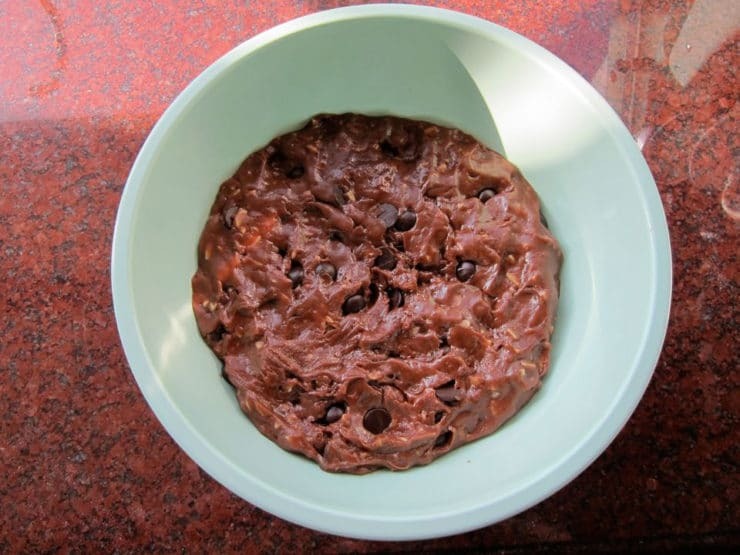 Add the almonds and chocolate chips and use the mixer to incorporate them into the dough. Place the dough in a bowl that will easily fit in your refrigerator. Cover the dough with plastic wrap and place in the refrigerator. Let the dough chill for at least 2 hours. You can chill it up to 48 hours before baking. When ready to bake, preheat your oven to 350 degrees F and line a baking sheet with parchment paper. 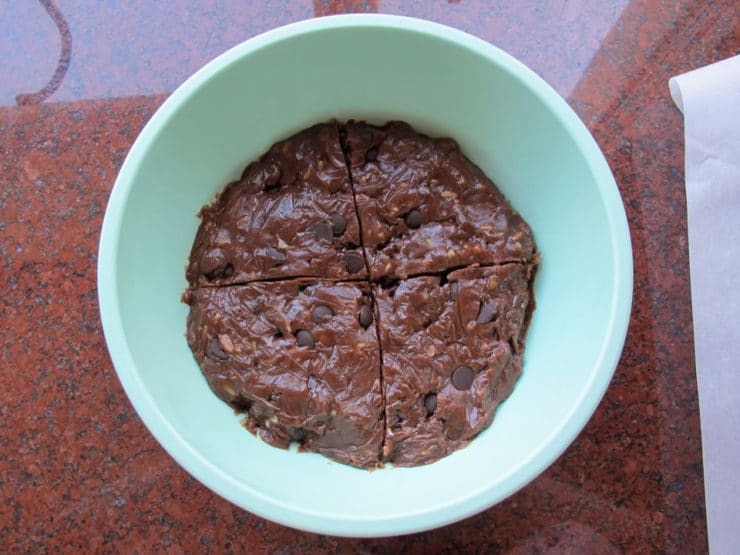 Slice the dough into four equal sections inside the bowl. Lightly grease your hands with canola oil. 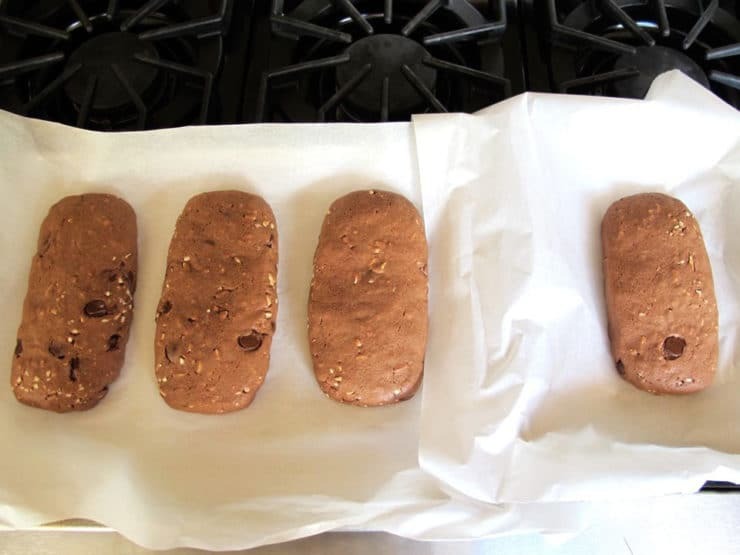 Take the 4 sections of chilled dough and form 4 long, thick rows or rectangles on the baking sheet. Each row should be about 3 ½ inches wide. Make sure you leave at least 1 inch between rows, as they will expand during baking. I usually put the fourth row on a second baking sheet so there is plenty of extra room for spreading. You can squeeze them all on one sheet if you prefer, but you might want to make the rows a bit narrower. Bake mandelbrot for 25 minutes. I like to line my baking sheet with parchment paper for easy cleanup. 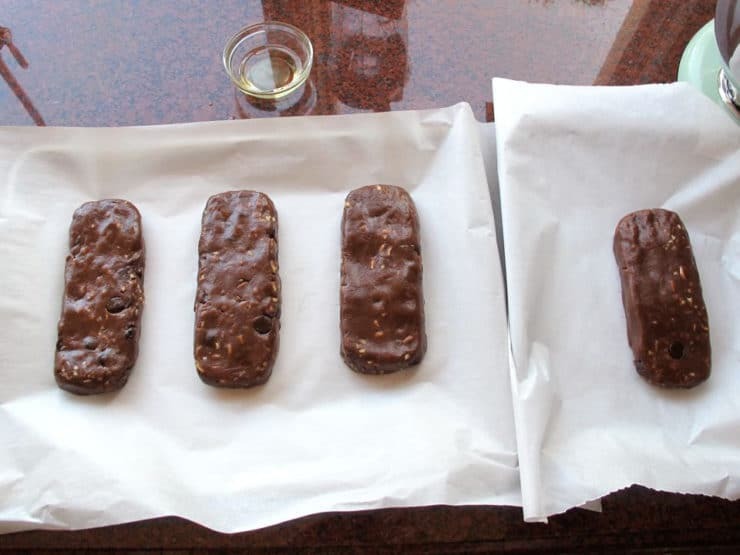 Take mandelbrot out of the oven and let the oven cool to 275 degrees F.
While oven is cooling, slice the 4 rows into ½ inch wide biscotti-sized slices. Put the slices cut-side down back onto the cookie, then bake at 275 degrees F for another 20 minutes, or until crisp. The longer they stay in the oven, the crisper they’ll be. Keep an eye on the texture and don’t over-bake, or the mandelbrot will dry out. Remove from the oven and allow to cool completely on a rack. 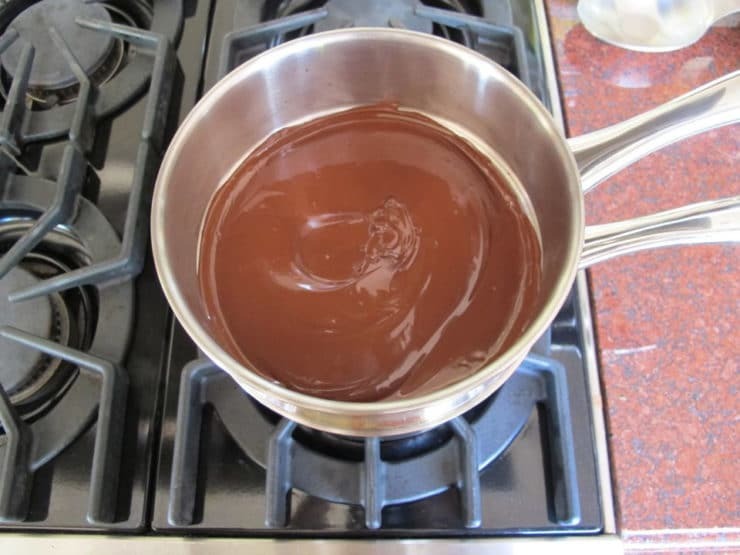 Slowly melt the dark or semisweet chocolate in a double boiler or in the microwave till smooth. Dip the mandelbrot into the chocolate. There are two ways to do this. The first way (which dries the prettiest) works best with a rack. Line the surface below the rack with paper to protect your countertop. Take a mandelbrot and dip the upper mounded half of the mandelbrot lengthwise into the chocolate. 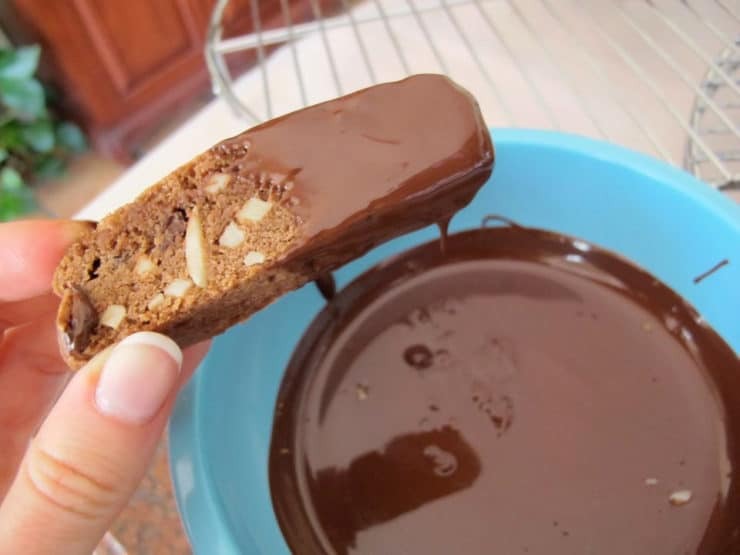 Turn the wet chocolate-coated side up and place it on the rack to dry. For the second dipping method, you’ll need a baking sheet lined with parchment or wax paper. 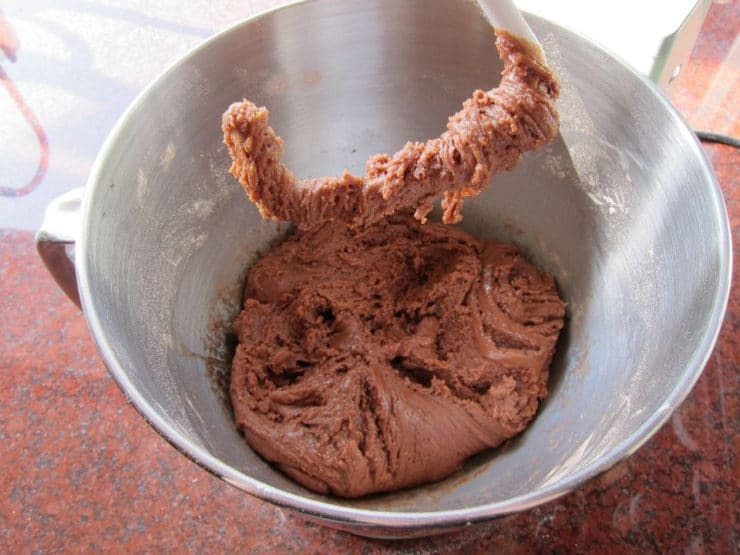 Melt the chocolate in a narrow container, so the chocolate pool is deep. 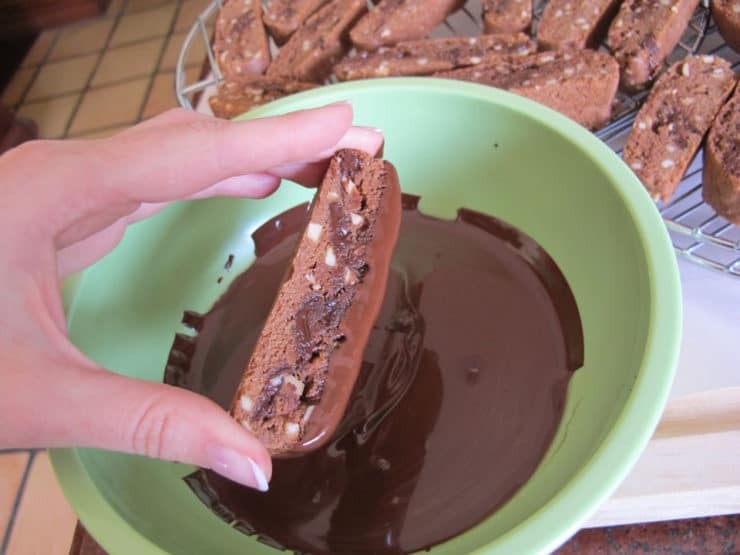 Dip the mandebrot endwise to coat the lower half of each piece with chocolate. Let the excess chocolate drip off the bottom of the mandelbrot. 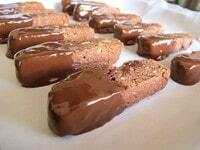 Place the chocolate dipped pieces onto the paper-lined sheet and allow to dry. You’ll need to leave the pieces for at least one hour to dry (they may take longer depending on the weather). You can put the pieces in the refrigerator if you want them to firm up more quickly. Store in an airtight container up to five days. For a longer shelf life, wrap each individual cookie in foil, place in a sealed plastic bag, and freeze for up to three weeks. Soft Mandelbrot Variation: You can use this recipe to make a softer cookie by only baking it for 25 minutes and skipping the second 20 minute baking cycle (which in essence “toasts” the cookies). Just make sure your cookies have baked all the way through after the first baking cycle – if the center of the cookies appear moist, bake for another few minutes until fully cooked. Keep a close eye on the cookies to make sure they don’t over-bake. This will give you a “soft” mandelbrot cookie. If I make the mandel bread but omit the chocolate coating, what method should I use to store it for one week (after I have let the pieces cool completely after baking)? Thank you. I was wondering if a recipe for the marble mandelbrot was ever posted. I used to get a chocolate iced soft marble mandelbrot in Rockland County in NY and have never been able to find one like it anywhere else. Cynthia– no, but that’s a great idea! Adding it to my recipe development list. These look amazing! I was wondering if i could use safflower oil or vegetable oil instead of canola, because unfortunately i don’t have any. You say that they will last for 5 days… How could you possibly know that?…There is no way they won’t all be eaten before then! Looks great and can be Parve, to boot – looking forward to trying soon. Thanks! Hi Charmell! I think chopped pecans would be great. Enjoy! I know you can’t reply to all the recipes, but any thoughts on my Dec. 8th reply about how to make marble mandel bread? Or what cookbooks I might check out for answers? Thanks SO MUCH for this awesome recipe (first learned about your blog on Norene’s Facebook page). The cookies are delicious and especially good for Hannukah because of the oil in the recipe. My family thanks you too! This is my 1st time finding your site + I love it. I used to buy Mondelbrot from a Bakery in Short Hills N.J. that I adored. It was diff. than any other that I have come across. It was a soft cookie with walnuts + cherries in a marble dough, with slivered almonds + caster sugar on the top of the sliced loaves. I don’t remember if the cherries were candied or jar type + there might have been chopped chocolate in the dough. Do you have any suggestions on how to duplicate it? This is the first recipe of yours that I’ve made and it was wonderful…definitely not the last I’ll make!! Made it for Kiddish after my beautiful new niece’s naming (welcome to the world Miryam Zayit!!) and they were a big hit. All the little old ladies at the temple asked me for the recipe. Haha. Thanks so much, Tori! So happy you liked it Emily! Since many mandelbrot recipies call for citrus zest, or ground citrus peels, I decided to add this to the recipie, about two tablespoons of ground citrus zest. The best part was, I used my esrog’s that I had used from Succos for their skin to supply the zest, which solved my yearly problem of what to do with my old esrogs after the holiday. Oh my deliciousness! Look at all that chocolatey goodness… They look amazing!! I will go wild with this recipe – like you sis, I’m a chocoholic, too. When I read the recipe, you wrote to add 1 cup of either semi-sweet, dark, or white chocolate chips – I thought why not a little of each? Mandelbrot – it has been sooo long since I read that word. Comforting to read your recipes as our heritage is similar. Delicious chocolate almond mandelbrot!! Thanks for sharing! You’ve made me Very happy with this recipe! Blessings to you & your family. Marcie and Shoshanna, so happy you liked the recipe! Shirley, congratulations to your daughter– mazel tov on her graduation! Maybe you can give her a box of mandelbrot as a graduation present. 🙂 Jocelyn, it will TOTALLY pass the choco-holic test, your dad will love them! 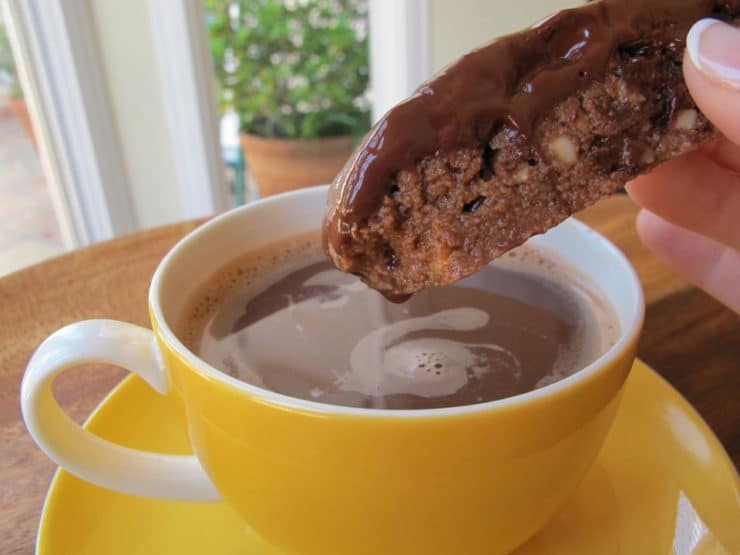 ok now that is a good looking cookie and i don’t think that there is enough chocolate at all! thank goodness it passed the sister test because my dad is the same way. can’t wait to make these for him. thanks for sharing. I made these and they turned out very nice! Can’t wit to try this recipe, it sounds yummy. Will have to wait until I come back from D.C. (my grand daughter’s graduation from medical school). I noticed you’re using the bread dough hook rather than the paddle. Any particular reason? Another great recipe! But, a question about parchment paper. Lately a lot of recipes seem to feature it. I’m skeptical it’s yet another ploy to get us to buy use-once and throw-away products. Can I do without it in this recipe and in recipes in general? Thanks. Hey Alice! I cook/bake a lot, and parchment paper makes for easy cleanup, which is one of the reasons why I use it. It also makes for a grease-free nonstick surface. You don’t need to use it necessarily (the mandelbrot don’t really need a nonstick surface since the dough has a lot of oil), but if you use the paper for this recipe you can re-use it underneath the baking racks when you coat the mandelbrot in chocolate, so it will serve a dual purpose. These look amazing. I can’t wait to make them. I know quite a few chocoholics who will appreciate these. Thanks so much for sharing.